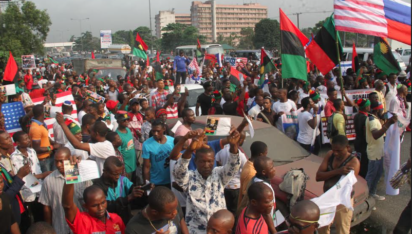 ENUGU—THE Indigenous People of Biafra, IPOB, has asked a United States federal court to commence the trial of 16 Nigerian officials it sued over their alleged direct or indirect complicity in the extrajudicial killings of its members, who launched peaceful protests following the arrest and detention of its Leader Mazi Nnamdi Kanu. This was contained in a statement issued by the Media and Publicity Secretary of IPOB, Comrade Emma Powerful and made available to Vanguard in Enugu, yesterday. The defendants include the Chief of Army Staff, COAS, General Tukur Yusuf Buratai, the Director General of the Department of State Services, DSS, Alhaji Lawal Musa Daura, the former Inspector General of Police, Solomon Arase, and his successor, Ibrahim Kpotun Idris as well as the Governors of Abia State, Dr Okezie Ikpazu, his Anambra State counterpart, Chief Willie Obiano and Ibrahim Attahiru. Others include Mr. M.I. Ibrahim; Kasim Umar Sidi; Issah Maigari Abdullahi; Habila Hosea; Peter Nwagbara; James Oshim Nwafor; Hosea Karma and Bassey Abang and Johnson Babatunde Kokomo. Some US based lawyers had in a counter motion filed on on February 6, 2018, on behalf of IPOB asked the Court for the District of Columbia to indict the Nigerian officials over the murder of the Biafran activists. However, the defence lawyers had in a counter motion asked the court to dismiss the suit based on “the act of state doctrine, lack of jurisdiction and sovereign immunity,” district court rejected. The post Biafran suit in America: US rejects Nigeria’s defence of immunity appeared first on Vanguard News.